The root of perennial herb Sanguisorba officinalis L. or root of S. officinalis L. var. longifolia ( Bert. ) Yu. et Li. of family Rosaceae. The former all around the China, the latter conventionally named Mian Di Yu in Anhui, Zhejiang and Jiangsu provinces in China. In spring before the sprout or in the autumn when it withered. Light smell, slightly bitter and astringent taste. hard, big with pink cross-section. Cut off fibrous roots, cleaned and dried in the sun, unprocessed or stir-baked into charcoal. Bitter, sour, astringent; liver and large intestine meridians entered. Cool blood to stop bleeding, relieve toxicity and heal wound. This herb is cold and bitter, entering the blood system. Thus it can cool blood to stop bleeding. In addition, being sour and astringent it is indicated for different kinds of bleeding caused by blood heat. And its descending and lowering property makes it suitable for bleeding of lower energizer. For hematochezia due to exuberant heat, it is usually combined with other heat-clearing and blood-cooling hemostatics. For instance it is combined with Sheng Di Huang, Huang Qin, Huai Hua and so on in Yue Ying Jian from Jing Yue Quan Shu. For bloody hemorrhoid with bright red color, it is combined with heat-clearing, descending and purging herbs. For instance it is combined with Huai Jiao, Huang Qin] and Zhi Qiao in Huai Jiao Wan from Tai Ping Hui Min He Ji Ju Fang. For red profuse vaginal bleeding of metrorrhagia and metrostaxis due to blood heat accompanied by dry mouth and lips, it is combined with heat-clearing and blood-cooling hemostatics. For instance there's an empirical formula in treating severe metrorrhagia from Nu Ke Yao Zhi (Essentials of Gynecology) and it is combined with heng Di Huang, Huang Qin and Mu Dan Pi. This herb clears heat and relieves toxicity, cools blood and astringes intestine to stop dysentery. So it is good at treating blood lingering dysentery. For instance it is combined with Gan Cao in Di Yu Tang from Shen Ji Zong Lu. 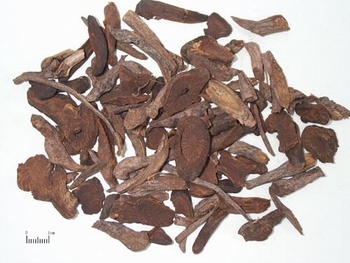 Being bitter and cold with actions of purging fire and relieving toxicities, sour and astringent with action of healing wound it is a key herb in treating empyrosis. Because is not only clears heat and cools blood, but relieves toxicity and eliminates swelling, it is indicated for sores, abscess and carbuncle before and after pus is formed. Its powder can be mixed with sesame oil and applied externally or combined with the powder of fire-purging and toxicity-relieving herbs externally used, such as Da Huang and Huang Lian. Besides, for eczema and cutaneous ulceration, it is applied externally by washing the affected area with its concentrated decoction, or putting its decoction infused gauze on the area, or casting the mixed powder on the area with wound-healing and tissue regeneration-promoting herbs, such as calcined Shi Gao and Ku Fan, etc. For sores, abscess and carbuncle, before pus formed, its decoction is washed or applied on the affected area. When pus is formed, use its paste pounded or mixed paste with other heat-clearing and toxicity-relieving herbs on the affected area. Decoct 10~15 g, large dose of 30 g. Proper dose is applied in pills and powder externally. Use the herb stir-baked into charcoal to stop bleeding and the unprocessed to relieve toxicity and heal wound.